Manicurist Exam Practice for State Board. 70 Free Questions! To assist in increasing your knowledge in subjects you may have struggled in, we recommend you take any of the Focus Exams. These exams focus on the indicated subject matter. They will not be timed, and will show you whether you have chosen the correct answer or the incorrect answer immediately. If you choose an incorrect answer, in one of these exams, you will be able to view the correct answer immediately. Each and every test will randomize the questions and answers when it is retaken. The 16 Focus Exams are listed here: (1) Acrylics, Gels, Wraps - 71 questions (2) Bacteria and Infectious Agents - 47 questions (3) Circulatory System - 49 questions (4) Electric Filing - 34 questions (5) General Anatomy - 31 questions (6) Manicuring & Pedicuring - 60 questions (7) Muscular System - 31 questions (8) Nail Service Tools - 34 questions (9) Nervous System - 30 questions (10) Nail Product Chemistry - 72 questions (11) Salon Safety & Client Consultation - 38 questions (12) Sanitation & Disinfection - 58 questions (13) Skeletal System - 31 questions (14) Specialty Services & Massage Movements - 39 questions (15) The Nail & Nail Disorders - 91 questions (16) The Skin & Skin Disorders - 85 questions. These are all available to you through the purchased Total Access page. We strongly recommend you take one of the 5 Timed Exams. These are designed to simulate a state board exam as much as possible. No one knows what the exact questions will be on your state board exam - so it is imperative to study all of your subjects and make good use of the different types of exams available to you here. The purpose of the timed exams is to simulate the pressure of completing the state board exam accurately and in plenty of time. Once the exam is complete you will see your statistics. These are all available to you through the purchased Total Access page. The Grand Exams have 500 questions each. There are 3 Grand Exams available. These are not timed. Passing one of these exams not only increases your memory and knowledge, but also your confidence. If you had any doubts in your ability to pass a written state board exam - you can overcome those doubts by passing at least one of the Grand Exams. You will be able to review the outline of the test as you take it. These are all available to you through the purchased Total Access page. FREE Questions and Answers. Unlimited Attempts. Feedback given each time you submit an answer! Review answers as you take a test. Why should you purchase the online nail tech exam service in order to prepare for your state board exam? In Manicuring school, students spend a great deal of time practicing clinical training with clients from the beauty school�s student salon. With clinical training, the student will also study theory subjects that are relative. For instance, before you begin to perform acrylic services on your client, you will need to understand the anatomy and chemistry that will be involved with the service. Likewise, In order to pass the state board licensing examination, a talented aspiring manicurist will need to know all the various details involved in nail care. 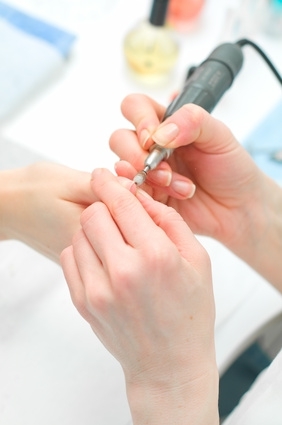 It is important to study and be tested on the muscles, joints, tendons and nerves in the areas a nail tech works with. The circulatory system and nail diseases as well as skin disorders are just as important as knowing how long to rock a nail tip during application. 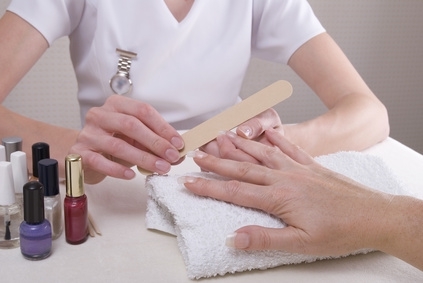 There are so many aspects to learning about the job of a manicurist � pedicurist in the U.S. In school you passed tests about bacteria and infectious agents, salon safety, first aid and state board regulations. You will have to pass those tested subjects at the state board exam, also. While the practical side was more fun, the studies and exams regarding acrylics, gels, wraps, electric filing, sanitation, consultation and all of the products and tools of the industry were very necessary to understand. You have worked very hard to get to this point. You have put in the hours. You have performed countless manicures, pedicures, acrylic nails. You have filed, you have sanitized over and over. You have studied systems of the body, the anatomy of the hands and feet, nail product chemistry, etc. The only thing that is left, before you can begin your dream career - is to pass your state board licensing exam! Whether you will work as a nail professional in California, Arizona, Arkansas, Colorado, Texas, New Mexico, New York, North Carolina, North Dakota, Ohio, Oklahoma, Connecticut, Delaware, Pennsylvania, Rhode Island, South Carolina, South Dakota, Tennessee, District of Columbia, Florida, Missouri, Montana, West Virginia, Nebraska, Nevada,Georgia, Hawaii, Idaho, Illinois, Indiana, Iowa, Kansas, Kentucky, Louisiana, Maine, Maryland, Massachusetts, Michigan, Minnesota, Mississippi, Alabama, Alaska, New Hampshire, New Jersey, Oregon, Utah, Vermont, Virginia, Washington, Wisconsin, and Wyoming - you must pass your state board exam first! You can do it. Improve your chances of passing your state board exam through review, practice and fortifying your confidence right here on this site! The testing companies do not reveal the exact questions on the exam to anyone - but they do reveal the topics on the exam and all the subjects within those topics. From that information, we were able to develop an exam service with a pool of 800 questions from the topics and subjects that will be included on the state board exams. You can choose total access to all exams where all 800 questions are available for you to practice with, or you can choose one subject (a la carte) or more, or topics, or many other smaller exams available on our site. Your best bet is to purchase total access to the online nail technology exams for only $22.99 where you will have access to unlimited attempts with any of our exams - or all of them. You will be able to practice and review questions similar to a state board exam, but in a relaxed environment, your own home, your own computer, at your own convenience. Remember, practice makes perfect. Now go for it... and Good Luck! For those who would prefer nail technician / manicuring and pedicuring practice exam questions and answers in print, we recommend: Nail Tech Exam Practice eBook Which correlates with the online practice exams on this site! Not to share your access to the exams with any other individual, business or organization - or - share the password to your access page with any other individual, business, or organization. To authorize payment from your credit or debit card.